Darlyn Thiele, age 86, of Milbank died March 19, 2018, at St. William’s Care Center. Funeral services will be held on Friday, March 23, 2018, at 10:30 a.m. at Emanuel Lutheran Church in Milbank. Rev. Caleb Schewe will officiate and burial will be in the Greenwood Cemetery in Big Stone City. Visitation will be held on Thursday from 5 – 7 p.m. at Mundwiler Funeral Home and continue at the church on Friday, one hour prior to the service. Casket bearers will be grandsons: Darin Thiele, David Thiele, Matthew Korstjens, Justin George, Michael Korstjens, Jeffery Korstjens, Paul Thiele Jr., and Jeremy Frensko. Honorary bearers will be granddaughters: Misty Pharr, Michelle Korstjens, Gina George, and Malinda Thiele; great-grandchildren; and the staff at St. William’s Care Center. Darlyn Bertha Steltz was born on March 21, 1931, in Roberts County, SD. She was the daughter of Paul John and Mabel Matilda (Hyatt) Steltz. Darlyn grew up in Roberts County and attended rural school in Geneseo Township. She was united in marriage with Eldred Milton Thiele on September 29, 1949, in Milbank. Following their marriage they farmed together southeast of Milbank. They operated Thiele Cleaning Company for a time period. They enjoyed driving for the local car dealerships in Milbank. Darlyn also worked several other jobs, including at Big Stone Canning Factory, St. William’s Care Center, and loved to babysit her grandchildren. 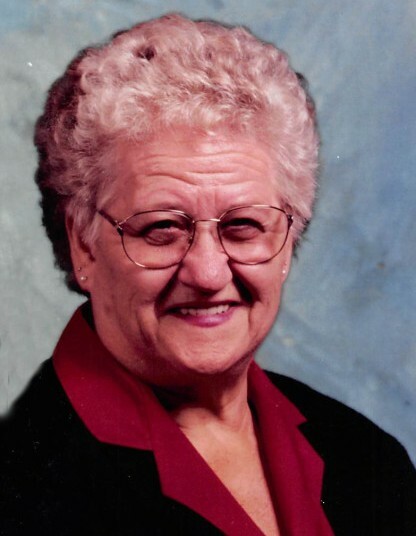 She was a member of a home extension club, sold Avon, and was a faithful member of Emanuel Lutheran Church. Darlyn loved animals, especially the farm cats and dogs. Most important to Darlyn was spending time with her family, especially her grandchildren and great-grandchildren. Her family will remember her delicious cinnamon rolls! Left to cherish her memory are her children: Paul (Deb) Thiele of Corona, SD; Lynda George of Paynesville, MN; Mary (Jim) Korstjens of Milbank, SD; Roger Thiele of Big Stone City, SD; daughter-in-law, Debbie Thiele of Milbank, SD; 12 grandchildren; 16 great-grandchildren; special friend, Don Strege of Milbank, SD; sisters-in-law: Marian Storm of Huron, SD; and Bev Seide of Eugene, OR. She was preceded in death by her parents, Paul and Mabel; husband, Eldred; son, Darwin; granddaughter, Danielle Thiele; son-in-law, Scott George; and infant brother, Gilbert Steltz.